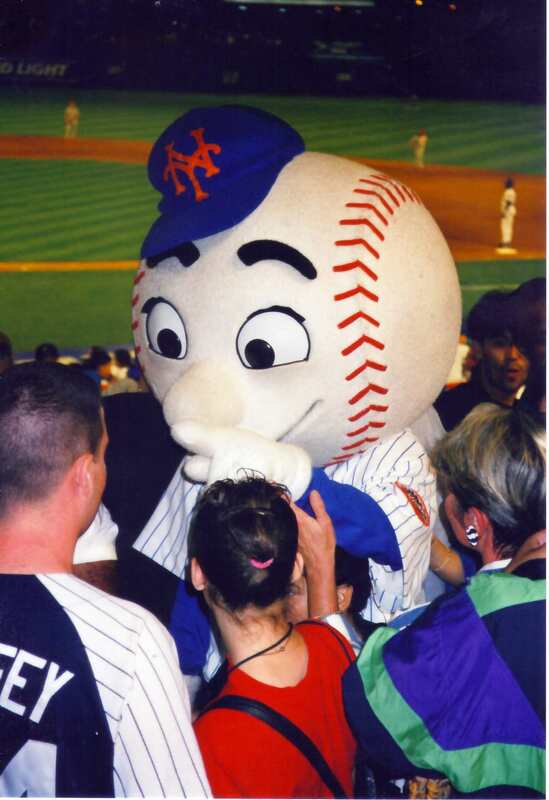 Beloved Mets mascot Mr. Met signs autographs during a 1997 game at Shea Stadium. 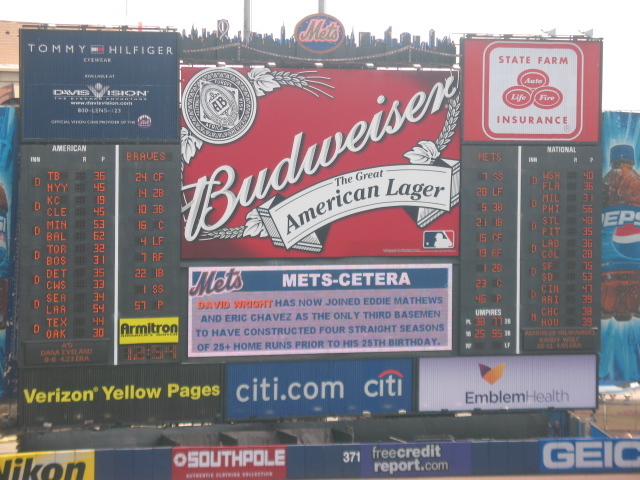 Yesterday, the Mets lost to the Marlins and brought an end to their 2008 season as well as the William A. Shea Municipal Stadium. The Mets will begin the 2009 season in a retro-ballpark modeled on Ebbets Field, but Shea Stadium will always be home for me. People criticize Shea for being a “concrete donut” but I think it has a lot more charm than the truly awful multi-use stadiums that followed it in Cincinatti, Philadelphia, and Pittsburgh. I think it compares well to Dodgers Stadium, although Dodgers has the advantage of an open concourse so one can still watch the game while going to the concessions stands and it has a full seat of outfield bleachers. On the other hand, Shea Stadium has much better public transit connections and a decent park nearby to wander around before a game. The big shame about CitiField is that for all its retro-ness it will still be in the middle of a parking lot and not a true neighborhood ballpark. 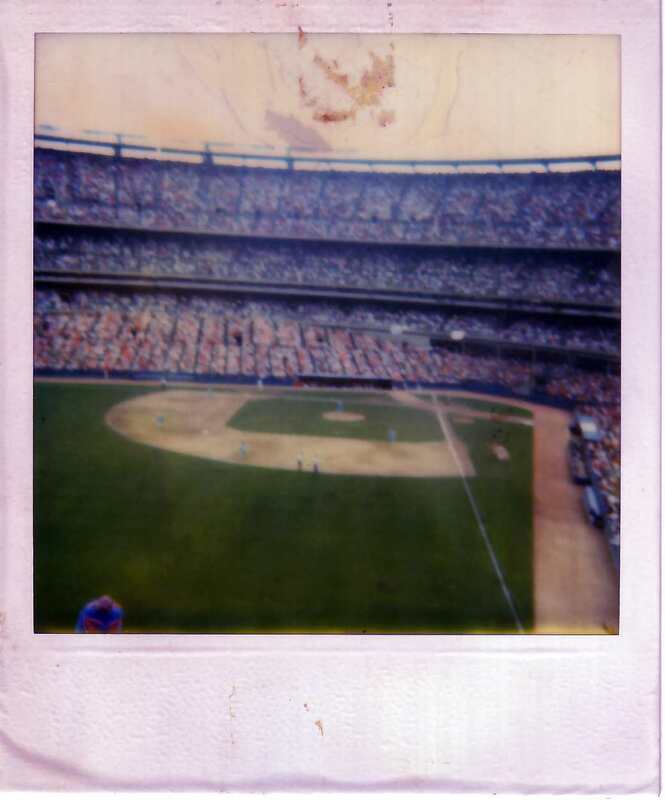 A Polaroid photo from the September 20th, 1986 Mets game against the Phillies at Shea Stadium. I’d hoped the Mets would clinch the NL East division title at this game but they’d already done it several days earlier. The grass was still all patched up from Mets fans storming the field and tearing the turf in celebration. Undoubtedly, Shea Stadium is the venue where I’ve attended the most sporting events in my lifetime. As a kid, I would go to Mets & Jets games with my family. The Jets games were especially interesting since we’d sit in the temporary wooden (splintery) bleachers in the end zones (roughly behind home plate and in front of the scoreboard in the baseball configuration). The seats by the scoreboard were particularly remote from things like restrooms and concessions. At one game I complained to my father of thirst and rather than go all the way to the concession stand and wait in a long line, he gave my some of his beer (which I didn’t like but it got me to shut up). I fell for the great Mets teams of the 1980’s there and returned in good years and lean in the 90’s and 2000’s. I have memories of going to games with my late father at Shea and more recent memories of attending games with my wife (and even my son in-utero!). Banner Day 1987. That’s right! A scheduled double-header and if you were artistically talented enough you could parade around the field with a bed sheet between games. And all for six bucks! Here are a dozen memorable games from my Shea history. 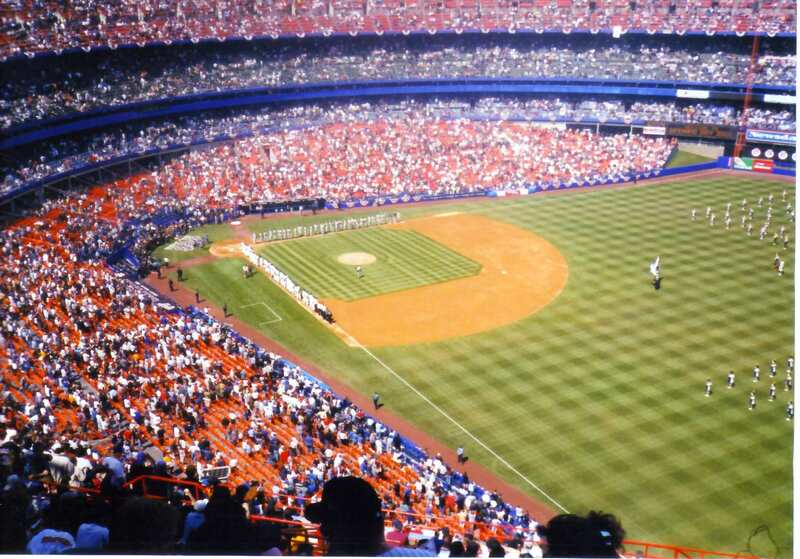 June 14, 1980: Giants 6, Mets 7 — This is the earliest game I can remember at Shea (and how could anyone forget it) but I probably went to some Mets & Jets games in the late 70’s too. We’d just returned from a vacation in California and my sister was wearing a San Francisco t-shirt, so we gave her a hard time but an older woman told us we were nice kids for wearing our Mets hats. The game ended on a walk-off 3-run homer by Steve Henderson. I kid you not when I say I’ve never been to a sporting event where the fans went completely insane in joyous celebration. No wonder I became a Mets fan. October 5, 1980: Patriots 21, Jets 11 — I don’t remember the game so much but afterwards my father (or was it my uncle?) knew some people having a tailgate in the parking lot. Some of the players actually came to the tailgate and I got to meet the Jets strong saftety Ken Schroy. I think it is not a coincidence that after meeting me, Schroy went on to lead the team with a career-high 8 interceptions. December 14, 1980: Saints 21, Jets 20 — The New Orleans Saints started the 1980 season with a 0-14 record and were poised to become the first NFL team without a win. The Jets prevented that with a loss of their own on an icey day where the winds swirled around Shea. After the game, several hundred drunken fans stormed the field and wrestled with one another in the snow. November 22, 1981: Dolphins 15, Jets 16 — A much better Jets memory as the team was able to rally in the fourth quarter and score a win against the hated Dolphins. This helped the Jets gain a spot in the playoffs, the first time any team I liked would participate in postseason play in my lifetime. Some game in 1985, could be August 24, 1985: Padres 1, Mets 5 — Mets fans remember Ray Knight as the hero and MVP of the 1986 World Series, but in 1985 Mets fans loved the light-hitting Knight as much as they love Luis Castillo today. I was fortunate to go to a game where Knight had multiple hits, drove in the majority of the runs, and topped it off with a great defensive gem. 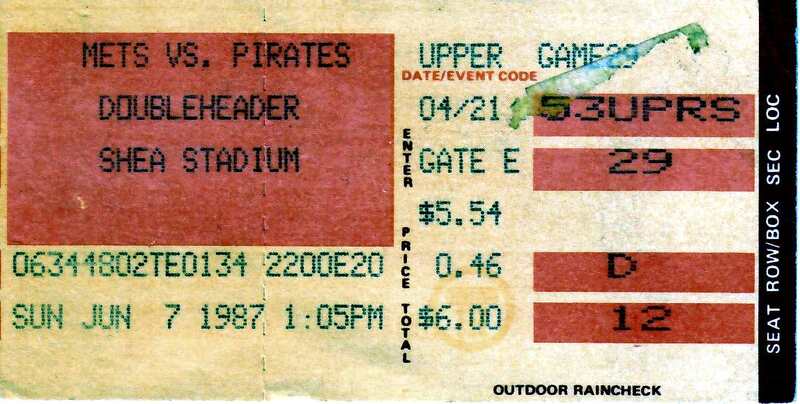 Unfortunately, I don’t remember when the game was or who the Mets played but it may be this game against the Padres. 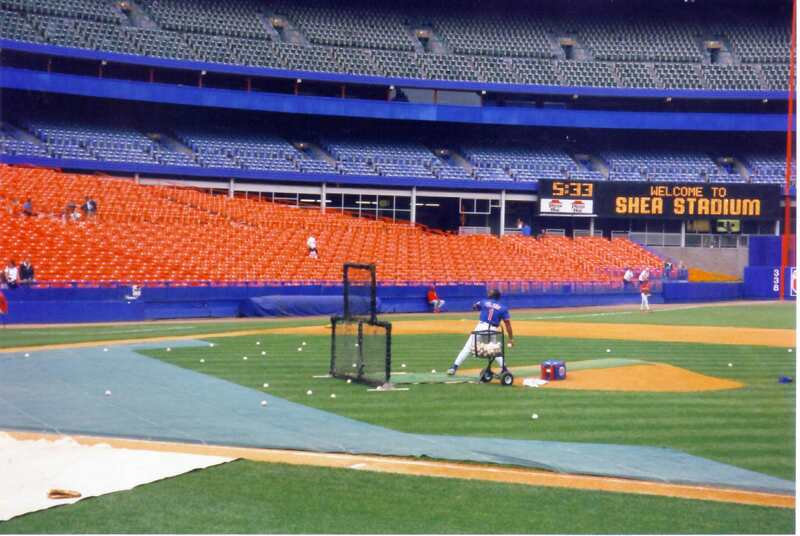 Mets legend Mookie Wilson throws batting practice before a game against the Phillies on September 8, 1997, my first game at Shea after a decade away. June 8, 1998: Devil Rays 0, Mets 3 — Prior to the game a man introduced himself to me as a Japanese sports reporter and asked “Preach to me the Mets pitching rotation?” The Mets had just acquired Japanese pitcher Hideo Nomo and I figure he wanted to know the rest of the Mets starters. I listed them off and he repeated them. It took a lot of self-control to not laugh when I said “Rick Reed” and he repeated “Lick Leed?” Lick, er, Rick pitched a great game that night going 6 2/3 innings until Wade Boggs hit a double to become Tampa Bay’s first baserunner of the night. As an added bonus, the Mets new catcher Mike Piazza hit his first home run at Shea as a Met. August 21, 1998: Cardinals 0, Mets 1 — This was the summer of Mark McGwire chasing, and finally surpassing, Roger Maris’ record of 61 home runs in a season. In the second game of a double-header, however, Armando Reynoso was the star striking out the mighty McGwire three times. 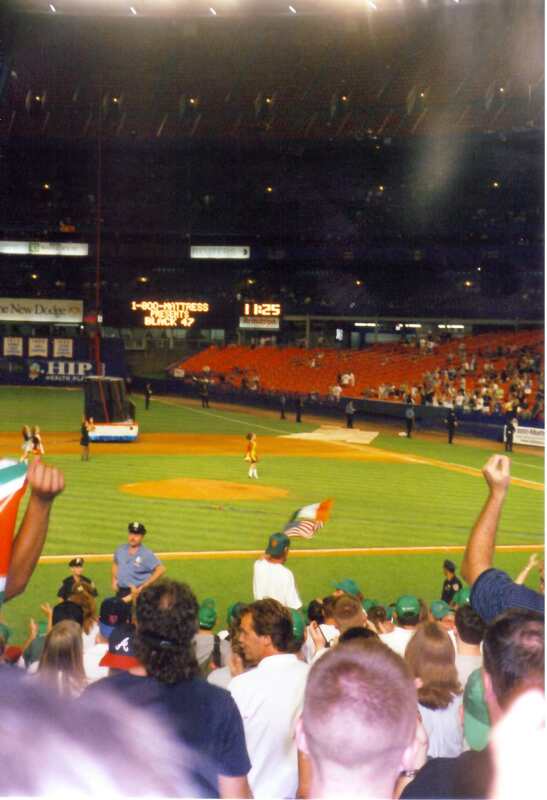 An Irish step-dancer takes the mound where Seaver and Gooden once pitched on Irish night in 1997. Aug. 12, 2000: Giants 2, Mets 3 — Irish Night at Shea, and one of my all-time favorite Mets made a big blunder. Benny Agbayani lost count of the number of outs and threw the ball to a fan after only the second out. Somehow, he actually got the ball back from the fan and threw it back into the infield to keep the runners from circling the bases. Following the game, the band Black 47 played a raucous set. October 15, 2000: Cardinals 6, Mets 10 — The first and only playoff game I’ve ever attend and also Susan’s first game at Shea. We sat in the notorious back rows of the Mezzanine where the Upper Level cuts off the view of the field creating a letterbox effect. At every exciting play (and there were many) those of us in the back row jumped up to cheer and then ducked down again so we could see the action. The Mets and Braves line up for introductions on Opening Day in 2001. April 9, 2001: Braves 4, Mets 9 — This was the only time I ever attended a home opener, which was a special one since Mr. Met and Ralph Kiner raised the 2000 National League pennant flag prior to the game. Tsuyoshi Shinjo tried to make up for the Mets not signing Alex Rodriguez with his first home run in the US, and Mike Piazza added two more homers. 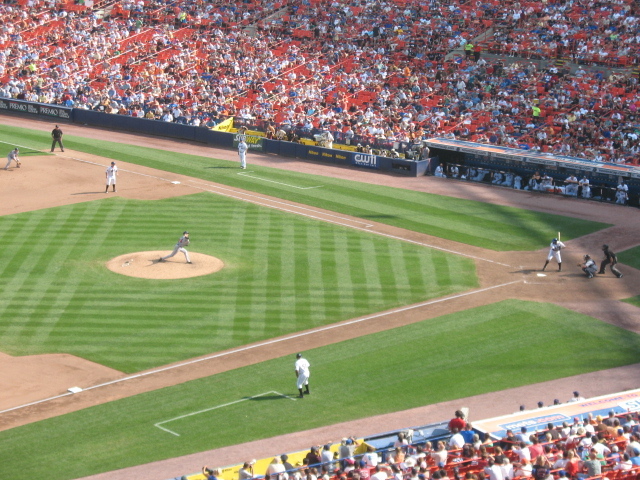 August 9, 2001: Brewers 3, Mets 4 — The now defunct MetsOnline.net Fan Forum got together for a game in the picnic area, the small set of bleachers in left field. It was a weekday afternoon game and it was something like 102°, most definitely the hottest game I’ve ever attended. It was fun to meet fellow Mets fans some of whom are still good friends of mine. I made a double-header of the day and saw the Brooklyn Cyclones play that night in Coney Island. On a sad note, this would be the last day I’d see the World Trade Center with my own eyes. April 21, 2007: Braves 2, Mets 7 — My Brave fan friend Mike and I made a tradition of going to see the Mets and Braves play at Shea once a season every year from 2005-2007. This game was the only one of the three in which Tom Glavine did not hand his former team the game on a silver platter. Instead Oliver Perez dominated the Braves and Mets scored most of their runs while I went to get ice cream for my pregnant wife. You can read more about this game in a previous blog post. 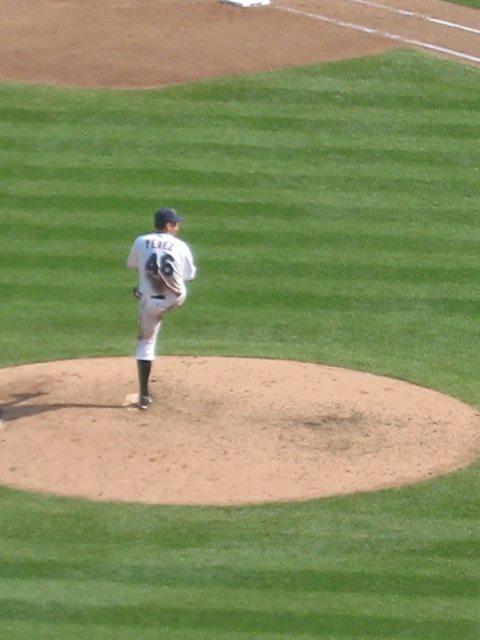 I attended my last game at Shea on September 14, 2008 versus the Braves. It started out well with two David Wright homeruns and nice pitching by Perez, but ended the way far too many 2008 Mets games ended: a blown save of the ridiculous variety! 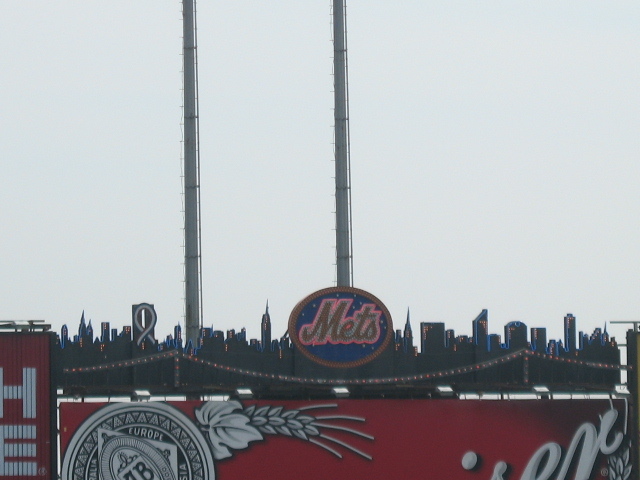 My pictures from that final game capture a few of the great landmarks of Shea. The big scoreboard is the best in baseball. Skyline sillouhette on the scoreboard. Mets Magic! 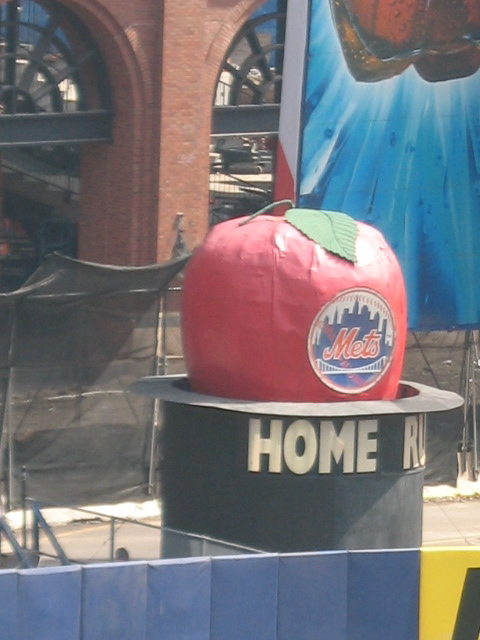 A big apple for every home run. Loved this post. There are some stories here that I hadn’t heard before. 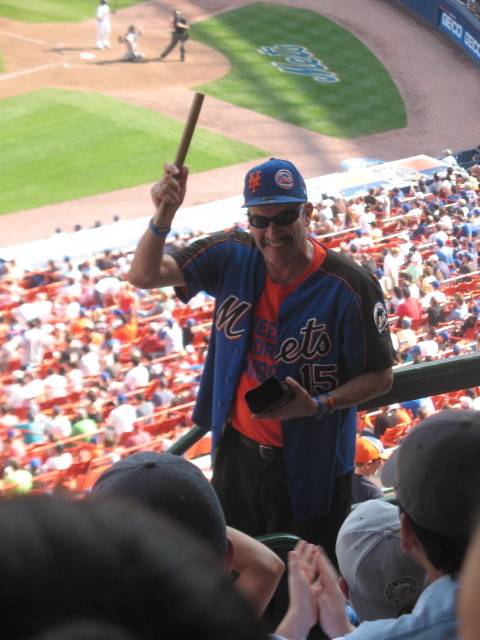 One of my favorite of your Shea Stadium stories, however, was sadly not shared. The two times I went to Shea are good memories for me too. The book is not solely about the Mets, but a story of how baseball impacted this family in Southern Indiana and also Eastern Kentucky. This kid really loved the Mets and still does. “‘I remember things like that–I really enjoyed the stories; they really took me back to when I was kid.” Kate S.
“‘I read it all in one setting! I couldn’t stop. I really liked it. '” according to Cindy D.